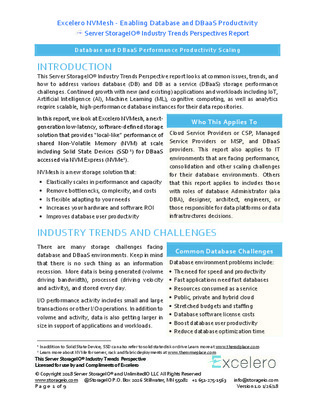 In order to deliver the performance that today’s database and database as a service (DBaaS) environments require, the underlying storage systems must overcome several challenges they create. These include an increase in data volumes, I/O performance activity that includes both small and large transactions, and the need to accommodate IoT, AI, and machine learning workloads. In this report, we look at Excelero’s NVMesh, a low‐latency storage solution that provides “local‐like” performance of shared NVMe to boost database performance, reduce the time needed for checkpoints, snapshots, and backups, and meet service requirements. Read on for the full list of benefits NVMesh brings to databases and DBaaS.